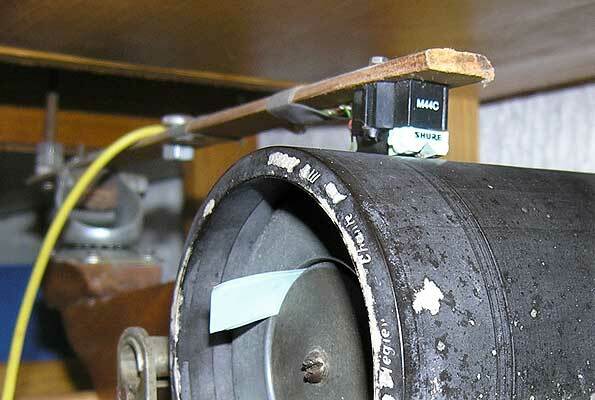 I have built a universal electric phonograph to make electric recordings of cylinders of all sizes. The motor is a japanese made modeling motor. It spins at 1000 rpm, and the speed is stepped down down by a series of PVC gears. This reduces the speed to that required for the cylinders and guarantees a perfectly even rotation. The speed can be regulated by a rheostat between the motor and the power supply. 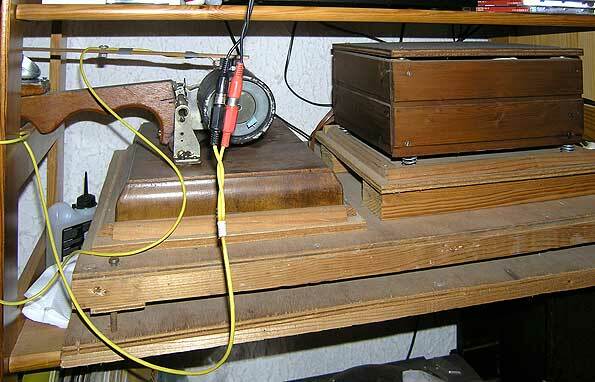 The motor is enclosed in a soundproof box that sits on four springs that absorb all vibrations, and well away from the phonograph, a Graphophone Eagle without motor. In the pictures the drive belt is not in place. That was the most difficult part to adjust, but I managed at last. The cylinders are played with a Shure M44C cartridge equipped with a number of styli for 2-minute and 4-minute wax and celluloid cylinders, made by Expert Stylus Company. The cartridge is connected by a long cable with a mono-stereo adapter to a stereo microphone or auxiliary input to a hifi equipment or to an equalizer or preamplifier. The long wooden arm sits on a ball bearing taken from a wheel of an office chair, turned upside down, and without the wheel. The arm is long enough to hold a number of nuts on a bar at its end, to regulate stylus pressure according to the condition of the cylinder. If the cylinders are too warped, the head of the arm starts bouncing and stylus pressure must be increased. The movement of the arm is not perfectly tangential, as the stylus moves along a circular arc over the cylinder. In order to make this arc less prominent I have made the arm 35 cm long. The stylus movement is guided by the groove. If it is damaged the stylus may stick in one place, as it does in non-tangeltial record players. The result of my transfer of cylinders was not so great. The range of frequencies recorded with the very sensitive Shure cartridge brings out lots of surface noise. It takes a digital equalizer to remove the unwanted frequencies. But this will always be an incomplete and ad hoc fix, and you will never know if you remove some useful frequencies in the process. Some cylinders can not be played with this player, if they are too damaged and scratched and have too irreguar surfaces.